About 12 people were detained by police after trouble broke out overnight at a rock festival. Leicestershire Police were called to the site of the Download Festival at Donington Park on Sunday night after reports of fires being started. They said when officers arrived, missiles were thrown at them while they tried to control the situation. No-one was seriously hurt. 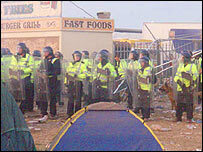 Some of those detained could face charges of assault and criminal damage. Police had earlier praised festival-goers and organisers for the well-run event as only four arrests had been reported until the trouble on Sunday night. Superintendent Les Milner, of Leicestershire Police, appealed for anyone who may have taken pictures or footage of the attacks on their mobile phones to get in touch. "The disorder involved a number of people and it is not clear at this early stage what sparked the trouble," he said. Supt Milner said investigations were ongoing and police were collecting witness statements from people still on the site. Festival director Stuart Galbraith, managing director of Live Nation Music UK, said: "There were 75,000 people per day at the event, and up until last night, there had been no major incidents over the weekend. "The trouble involved a small number of otherwise fantastic customers who attended this massively successful event. "This type of trouble is very rare and is completely out of character for Download fans," he said. Headline act Guns N' Roses closed the three-day festival. The band's last appearance at the festival in 1988 ended in trouble when a crowd of 107, 000 people surged towards the stage, crushing two fans to death.